The Zest turns heads in her own unique manner. People stop to smile, as if in recognition of all that Tata have managed to do so far. There’s the signature grille, flanked by those large headlamps and the Tata Logo sitting proudly in the centre. Since this is the top end XT trim, there’s this minimalistic chrome surround for the grille, which end up enhancing the looks (unlike the thick n unappealing stuff on the competition). The large headlamps are a projector setup with LED guide rings that look rather fetching in the dark. Not to mention the fact that they light up the road nice and bright too. Move down towards the bottom and you have your fog lamps and the LED Daytime Running Lights (DRLs). Unfortunately, there seems to be a bit of a problem with them on our long-termer and have refused to light up till now. So we can’t quite comment on their effectiveness. Let your eyes flow over to the opposite end and it is the tail-lamps that prove to be the show-stealer here. While the boot-lid/bumper design isn’t anything to find fault with, those large LED lamps really lift up the visual appeal. Pull the grab handle (it does feel unexpectedly light), to step inside and you are greeted by a rather neat looking dashboard that’s finished in dual-tone colours. Shut the door and again that lack of heft that you’d expect from a Tata product is missing. (No, this isn’t to question the build quality of the car, rather, it is about the perception about the brand on the whole.) The confusion that runs amok for a minute or two is epic, as the brain tries to comprehend a light-weight Tata! But then, the Zest is that much of a game-changer for the company. Getting behind the wheel, the large steering wheel makes you feel at ease. You get the audio controls on the left spoke of the steering wheel while the mobile phone controls are present on both sides. The Horn pad is large enough and easy to press too, though the horn itself could do with a bit of bass in it. The dual-tone dashboard is finished more in black than the beige, which is a good thing from a usability point-of-view. Though we’d have loved it if Tata had used softer plastics, as the current one feels rough to touch. The large wing mirrors are a boon, particularly in traffic, as one can catch those darting motorists with ease. Just like the exteriors, interiors are also spiced up by adding various class leading elements in the sedan. The Zest sedan has the best inner cabin spaciousness as compared to any other sedan in its segment. There is plenty of legroom due to the enhanced wheelbase, same goes for the immense shoulder room as width is also best-in-class. The interiors have been presented in a dual-tone Java Black & Latte color scheme with fully fabric seat upholstery. The dashboard is also quite stylish and premium in accordance with the Tata Motors next-generation 3-spoke tilt adjustable electric power steering wheel. The all new instrument panel displays several types of information on it such as Segmented multi-info display, Gear shift (up/down) and in-gear indicator, Driver seat belt reminder with buzzer, Individual door-open display, Light-off and key-in reminder with buzzer, Distance-to-empty info, Fuel consumption display, Digital fuel gauge etc. to mention a few. The top-end variant XT has an added functionality of Ambient temperature display with it. The sedan, despite being a sub 4-meter product, comes with a massive boot space of 390-litres. Turn the key and you’ll be struggling to tell if the engine is ticking or not – Tata have done a great job here with the Revotron engine. The 1.2 Litre turbo-charged engine will surprise you with its non-existent spool-up times on the ‘charger. Reach out for that innocuously placed ‘Sport’ button and she’ll even quicken her pace that wee bit more. Yes, Tata have equipped the Zest with Eco, Normal & Sport modes. Essentially three maps that correspond to their intended usage; the Eco & the Normal mode as expected, were quite sedate, having been tuned more for stretching that fuel mile. It would have been nice though to feel some sort of surge (or thrust) that’d propel you forward in the way you’d expect from an engine holding 90 ponies within. Tata have tuned this engine for driveability and comfortable motoring, and it shows when you get enthusiastic with the throttle. The engine note does sound a lot nicer when she’s revved to the higher limits of the rev range though. The Zest isn’t a corner carver, let’s be sure on that. So chuck that thought of nailing the apex in it out the window! Rather, head out for a relaxed, stress-free drive, catch up on your thoughts and conversations with co-passengers. Or simply taken in the scenery while the fantastic ride quality dismisses the bumps with minimal fuss. If you’ve experienced the joy of sinking into a plush sofa, then you’ll know just how tough it is to get off it. One really has to have a darn good reason to get you to budge and that’s pretty much the feeling that one gets in the Zest. The amply bolstered seats are a joy and with that pliant suspension giving you a well-damped ride, you soon realize that maybe, the Zest does want you to enjoy the ‘good’ life. And that’s what the Zest is all about. The best iteration of a compact sedan from Tata, and a turbo-petrol powered one at that. As we bid adieu to the Zest, we’ve come to love her for her strengths, and while the competition does have a lot to offer, Tata have done a commendable job on this car. Not only does it hold its own against the others in the segment, but she has a lot going for her. So, if you are in the market for a compact sedan that’s youthful and modern enough to draw admiring looks from people on the street, while having enough space to accommodate the family on those weekend trips – then it is time, to add some ‘Zest’ in your life! The Tata Zest is underpinned by the X1 platform which underpins the Vista and Manza. This platform is known for offering a good balance of ride and handling but it’s even better in the Zest. Ride quality is fantastic, the suspension isolating the worst of bumps with ease. Even big bumps don’t unsettle the car by much and that lends it a very mature ride quality which will be appreciated by all passengers (ride quality at the rear is also very good). The Zest doesn’t get bouncy on bad roads and remains glued to the tarmac at high speeds. There is no nervousness felt at all. The car uses the ninth generation Bosch ABS with EBD and braking performance is very good with the car not locking up even under heavy braking. The ABS has ‘Corner Braking Stability’ feature and when you launch the car aggressively, there is very little wheel spin. 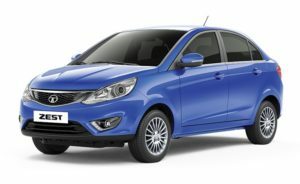 Tata Motors has adopted an electric power steering for the Zest (the Manza used a hydraulic unit). Known as EPAS, this steering is similar to the one on the Nano Twist and has been developed by ZFLS. It has an Active Return function which works well to pull the steering back to straight position when you take a u-turn. The steering is speed sensitive, it isn’t too light at low speeds but becomes heavy at high speeds, giving decent feedback but is numb at the straight ahead position. Narain Karthikeyan has tested the car for dynamics and the Zest handles well too, there is some body roll and understeer kicks in quickly when you corner very aggressively. The vehicle runs on Bridgestone tyres which offer good grip. A sub 4-metre Tata sedan has been a long time coming and all that wait seems to be well worth it. Tata Motors has finally cracked it. The Zest is a car which is not only a step up for the company, it’s a step up in multiple ways for the segment in which it is going to be positioned. The car comes with many first in class features which will make competitors sweat and force them to up their game. The Zest is unlike any Tata car, there is no compromise on anything. Right from a state of the art turbo petrol engine to an infotainment system which can put cars five times the price to shame. Then there is the generous equipment list, high attention to detail, fantastic ride quality and the list is almost endless. The Tata Zest is bound to be a sure shot hit in the Indian market, it’s that good a car.